Our guest speaker Adam Challis, Head of Residential Research at global property advisor JLL provided timely insight at this week's events. As a regular presenter and market commentator in UK and international media, we were honoured to welcome Adam Challis, whose experience spans more than a decade of research in the UK and overseas, and who is also author of numerous reports on market-facing issues – to share his insights on what is likely to shape market performance in the Capital over the year ahead. The seminar covered a wide range of topics and valuable insight covering London’s competitiveness as a financial centre, the continued confidence in London from an investment perspective as well as central London development prices. Adam’s seminar was incredibly well received by all and we are delighted to partner with Adam and JLL to be able to offer research of such value to our clients. 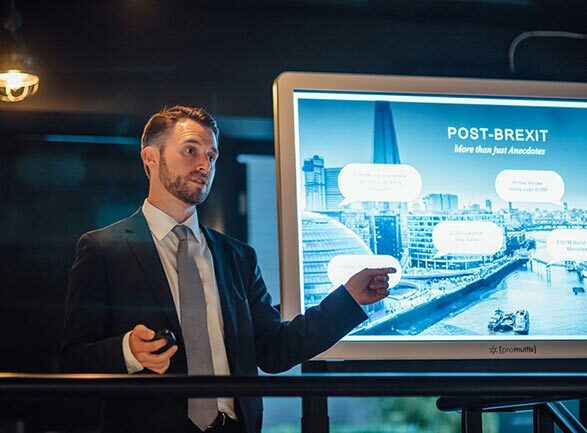 Events continued the following evening when City Wharf hosted its first Institute of Directors (IoD) networking event where over 40 members came along to join us for wine, canapés and networking as well as highlights from Adam Challis’ BREXIT seminar. We are delighted to have the opportunity to support one of the UK’s longest-running organisations for professional leaders and encourage a culture of collaboration, knowledge-sharing and networking.